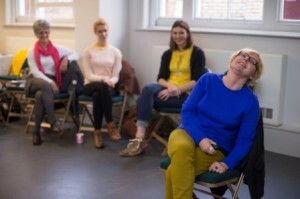 Since 2011, lightsgoingon has offered a variety of ways to explore and understand contemporary art, through a unique range of courses, workshops, projects and events. But I have a new role, as Director, Audience Engagement at the MCA in Sydney, Australia – I start work there on 3 August for three years. 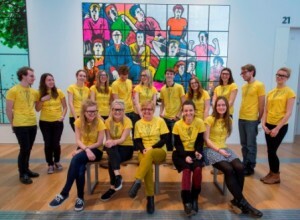 Over the past three years, lightsgoingon has covered a range of high quality approaches to working with contemporary art and audiences to support staff working in museums, galleries, National Trust properties and in outdoor spaces (public art) including British Art Show7 in Plymouth, Folkestone Triennial and RAMM in Exeter. The training does two things: it builds both knowledge and confidence within staff, enabling them to engage more deeply with visitors and with each other. It also focuses on seeing visitors as active learners and participants, not passive, thus establishing a more confident audience for contemporary art in the future. On Saturday 29 March 2014, I spent the day at RAMM (Royal Albert Memorial Museum) in Exeter, training fifteen students from the University of Exeter, looking at ‘what is contemporary art?’, ‘who are Gilbert and George’; and looking at working with visitors to enhance their experience and enjoyment of the exhibition. This is an selection of work by Gilbert and George, as part of ARTIST ROOMS, and it’s a great idea to enable both the volunteers and the visitors to be able to access the work through dialogue and conversation. A few images.. Thanks for a great day. It has really helped me, not only as a micro-volunteer but also a history of art student. I thought it was all really good, really interesting artists, good diversity in the people talked about. Really liked the stuff about the fluxus movement and generally the background movements and how they influenced the development of art. Personally I liked the emphasis on feminist artists because I think it’s really interesting. Delivery was really great; very enthusiastic and entertaining as well as fascinating and informative. I really appreciated learning about the art styles and movements of the past 100 years, as I went in without any kind of prior knowledge. Some of the topics are challenging as well, so to have someone who was clearly passionate and experienced on the subject was valuable. I may still not enjoy the art particularly, but at least now I can talk more comfortably about the art and its wider contexts. 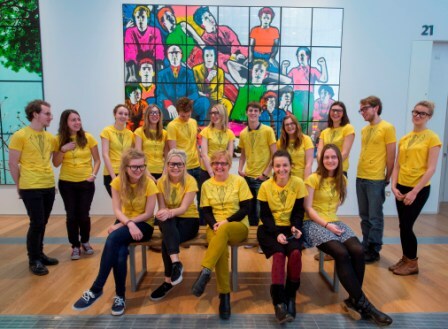 The film below gives you an idea of what part of the training covers – a whistlestop tour through contemporary art.. Thank you so much for coming to Ham House and giving us such an inspirational talk…Your engaging style was fantastic and just what we were hoping for to allow people to begin to understand contemporary art. Of course there were some very knowledgeable people in the audience but I think it was interesting and accessible for everyone. 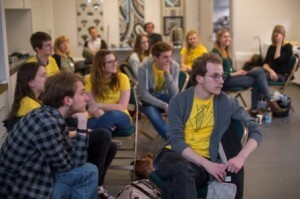 The training is for any cultural organisation that wants to look at how front of house staff / gallery assistants can make contemporary art accessible through dialogue. The films are for two kinds of audiences - 'How to Read an Exhibition' is aimed at those who are curious but not very confident about contemporary art. 'What is Criticality' is for fine art students and artist who are puzzled about what criticality actually is and who they can use it in their art practice..